Our research develops logical foundations for cyber-physical systems (CPS), i.e., systems that combine cyber aspects such as communication and computer control with physical aspects such as movement in space. CPS applications abound. Ensuring their correct functioning, however, is a serious challenge. Scientists and engineers need analytic tools to understand and predict the behavior of their systems. That's the key to designing smart and reliable control. By providing such analytic foundations, this research addresses an intellectual grand challenge that has substantial scientific, economical, societal, and educational impact arising from the benefits of improved CPS analysis and design. In order to tame their complexity, we study CPS as multi-dynamical systems, i.e., in terms of the elementary dynamical aspects of their parts. Hybrid Games Stoch. Hyb. Sys. Multi-billion dollar industries spend 50% of the development cost on control software design and testing. This cannot be sustained any longer. The foundations of computer science have revolutionized our society. We need even stronger foundations when software reaches out into our physical world. Multi-dynamical systems are a unifying principle for education and enable students to focus on one dynamical aspect at a time without missing the big picture. They overcome the divide between computer science and engineering that keeps causing unreconcilable differences among design teams. This project develops cross-departmental graduate/undergraduate courses on Logical Foundations of CPS as prime examples of STEM integration. Long-term goals include a K-12 outreach that inspires the youth to pursue science careers with an early exposure to mathematical beauty and exciting societal challenges. CPS foundations excel in demonstrating the paramount importance of discrete and continuous mathematics, not even as separate disciplines, but well-integrated. 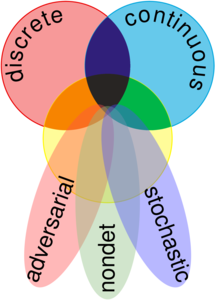 We take a view that we call multi-dynamical systems [6,7,16], i.e., the principle to understand complex systems as a combination of multiple elementary dynamical aspects. This approach helps us tame the complexity of complex systems by understanding that their complexity just comes from combining lots of simple dynamical aspects with one another. The overall system itself is still as complicated as the whole application. But since differential dynamic logics and proofs are compositional, we can leverage the fact that the individual parts of a system are simpler than the whole, and we can prove correctness properties about the whole system by reduction to simpler proofs about their parts. This approach demonstrates that the whole can be greater than the sum of all parts. The whole system is complicated, but we can still tame its complexity by an analysis of its parts, which are simpler. Completeness results are the theoretical justification why this multi-dynamical systems principle works. Multi-dynamical systems are dynamical systems that can combine discrete dynamics, continuous dynamics, adversarial dynamics, nondeterministic dynamics, and stochastic dynamics to model cyber-physical systems. Dynamic logics for multi-dynamical systems capture the foundations and fundamental reasoning principles for those multi-dynamical systems. 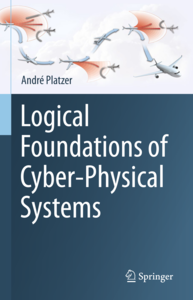 A high-level overview of the principles behind the logical foundations of cyber-physical systems are in an invited IJCAR paper . A technical survey of some aspects of the logical foundations of cyber-physical systems and multi-dynamical systems can be found in an invited tutorial at LICS'12  and an extended manuscript  and in B.EATCS . Main technical developments of core multi-dynamical systems are in [1,4,5,14,17,23]. Also see publications by area and the publication reading guide. Many other papers develop part of the logical foundations of cyber-physical systems. See complete list of publications.